One of the most common questions I receive from new freelance writers is “Where can I find the high paying freelance writing jobs you always talk about?” What they don’t understand at first is that the problem they face is right in their question. They’re looking for the “where,” when there is none. The right question starts with “How?” Let’s talk about why that’s the case, and what you can do about it. You see, there’s no magical faerie land brimming with super awesome freelance writing gigs and clients grinning ear to ear just waiting for you to come along so they can hand over wads of cash. Oh, how I wish. That just isn’t how things work. It’s true. You might find some decent freelance writing jobs on job boards, blog listings, freelance bidding sites, or even social networks. But most high-paying gigs never make it that far. They aren’t advertised (and those that are usually come with greater competition). Why? The surplus of low priced writers means clients can easily become inundated with unqualified applicants if they dare to say they’re willing to pay professional rates. Suddenly their public gig looks like the “big break” the low-priced writers are waiting for. So those buyers take their bigger budgets elsewhere to save themselves time and headaches. “If many of the best freelance writing jobs aren’t advertised publicly, how the heck am I ever going to find them?” you might be thinking. It’s easier than many freelancers expect. In short, you make the gigs come to you. The client does an online search for the type of writer they need (such as “business writer” or “health blogger”). Your site appears high in the search results. They check out your site. You wow them with your credentials and portfolio. Your rates suit their budget. They contact you. It’s a good fit. Bam! You just landed the gig. The client reaches out to past writers they’ve worked with (even on unrelated projects). If that writer isn’t available or doesn’t feel the project is right for them, the client will frequently ask if they can refer a trusted colleague. That colleague knows you rock and specialize in what the client needs, so they refer you. The client is given your contact information or your website address where they can learn more. You fall instantly in love (professionally speaking), and that awesome gig is yours. The client asks for similar referrals from their employees. This is especially true if the employees will work directly with you, and they may have experience with specific freelance writers from a past position they held. Again, your info is passed along and either your conversation or your website will sell your services for you. The client asks their competitors who they’ve used. Yes, they really do talk to their competitors in some cases. Remember, their competition is also made up of colleagues. Just like you network with other freelance writers (you do, right? ), your clients very likely network with colleagues in their own industry. Some don’t mind using the same freelancers at the same time, and some will pass on info from those they’ve worked with in the past (since not all gigs are ongoing and they don’t always directly compete). And, you guessed it, the client will either contact you or visit your website to review your marketing copy and portfolio. Make them work for you! You’ll notice some common elements here. Most importantly, there’s your professional website. If you want gigs to come to you, it helps a lot to have one. It gives you a home base with a sales pitch for your services, and it gives you somewhere to showcase your portfolio. Search rankings and referrals get prospects to your site. And it’s up to your site to convert them into leads to contact you directly (if the referral doesn’t have them do that up front). I know some writers assume this kind of approach takes too long. It doesn’t. It took me only three months after going full-time with my freelance writing before I had so many incoming gigs that I had to set up a waiting list. I know freelancers who have filled their schedule with gigs that came to them even faster than that. Sure, it could take longer. But it doesn’t take long for gigs to start coming in this way (and better-than-advertised gigs at that). Decide who you want to write for. Then pitch them directly. Yep. That’s all there is to it. If you don’t want to wait for clients to find you and you’re tired of all of the low-paying freelance writing jobs on ad boards and bidding sites, just pitch people and make it happen. Sometimes the best clients don’t even realize they need you until you let them know. Of course you have to be tactful about it if you suggest something like edits to their existing copy (as they might be quite proud of it). For example, let’s say you’re a tech writer. There are countless projects you could directly pitch to prospects. Maybe you love a new software program but the instruction manual is almost indecipherable. Pitch your services to clean it up or write a new one. Or maybe you notice that same company sells B-to-B software, but they don’t have any white papers on the site. You might pitch them white paper writing services by conveying the value of white papers in making executive-level sales decisions. Or maybe their marketing copy on-site focuses so much on features that they forget to mention benefits to the buyer. You could pitch those web copywriting services, helping them take something technical to a level more buyers would appreciate — because developers and the buying public don’t always think the same things are most important. The most important thing to remember is that if you want higher paying freelance writing jobs, you need to stop asking “where” they are. Start asking “how” you can get them instead. Maybe then you’ll find the solutions you’re looking for and the gigs that pay you what you’re worth. Jennifer Mattern is a freelance business writer and professional blogger who writes about freelance writing, social media, and small business. She also publishes e-books for freelance writers and is scheduled to publish her first nonfiction book, The Query-Free Freelancer, next year. I never quite thought about the question that way, but you are right that the HOW is usually more important than the WHERE. It’s just more challenging and I think people are generally lazy and would prefer to complain about how there aren’t any good jobs. At least that is what I see a lot of. Your approach also shows the importance of client relationships; the more people in your network who know you and like your work, it’s exponential. It’s the simple stuff we overlook, isn’t it? Great post, Jenn. Great post Jenn. I see people asking how they can get private clients and better paying private clients – there is always someone that wants to know! And this is a great post. I think what it comes right down to is that freelance writing is a BUSINESS and you have to treat it like a business. Clients won’t come to you until you put yourself out there and make some real effort at presenting yourself in the right light. Mike – You’re absolutely right. People often do look for the lazy way out. And in this case it’s downright silly because they actually put in more effort and get less of a return than they would if they’d just accept the fact that more visible doesn’t really equal easier in this case. Lori – Yep. Always the stuff staring us right in the face. Danielle – Absolutely. There’s too much of this (inaccurate) “anyone can do it” mentality surrounding freelancing and writing in general. But if you really know your stuff and you treat that work like the business it is, you don’t neglect the marketing, PR, and networking that will set you apart from the amateurs. Jenn, thanks for a thought-provoking and insightful cameo! Great post! I’m currently making the move from content mill writing to better-paying clients. I do have a little bit of experience outside of content mill writing, but I am hoping to completely phase out the content mill writing by the end of the year. I have been aggressively working on marketing and building my writer site this last week. It’s comforting to hear that it may take 3 months or longer for clients to start coming to you. I was starting to worry that the content on my writer site and social media profiles was sub-par; but now I can avoid stressing for a bit. @Corey and Corbin, best of luck and thanks for the kind words. @Sarah, great to hear you’re ready to make a transition away from the grind of the mills. It does take a while before the referrals start to roll in, and you do have to keep at it—but it’s worth it! Great tips! Instinctively, I know that it’s not the “where,” but the “how.” I find achieving that “how” part difficult in a situation that you are torn among your need for further sharpening of your skills, the need to earn for a living, and the need for spare time to write for your own site. It’s great to hear a confirmation from an experienced freelance writer. Thanks! Excellent information on locating better paying clients! Many writers who find themselves stuck in the rut of low paying work are often at a loss when it comes to attracting clients who are willing to pay for quality work. It’s easy sometimes to forget that being proactive in finding new clients is also an essential part of being a freelance writer. Ruel and Deirdre, thanks for your comments! Great post! I’ve been freelancing for over three years now, and put up my own website earlier this year. Even though I put up my portfolio and details of services, I still find it an overwhelming task to work on SEO from scratch. I guess it’s because I’m getting a pretty decent rate from my regular clients at oDesk, so I am not putting in any effort into the website. But reading your post, Jenn, and all the comments, I am thinking that I should definitely contribute more time to my own site as well. May be a dedicated hour or two over the weekends? More? Hey, sometimes those lower-paid easy gigs that you know like the back of your hand can really fill in the gaps in your schedule. I find one that paid $600 or so for feature articles from profgigs.com, the stories were fairly easy to do and hit the front page of Yahoo a lot, so there was really massive exposure. Kept it for a couple years just for that. 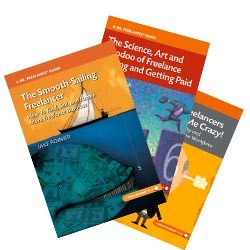 Reading http://DoctorFreelance.com/where-can-i-find-high-paying-freelance-writing-jobs/ Love solid, practical advice!